What is a Car Construction Record? Pullman maintained one Car Construction Record (CCR) for each car it operated. This included all Pullman-built heavyweight and lightweight sleepers, parlor cars, club/lounge cars and Tourist sleepers, and lightweight sleepers built by Budd and ACF but operated by Pullman. 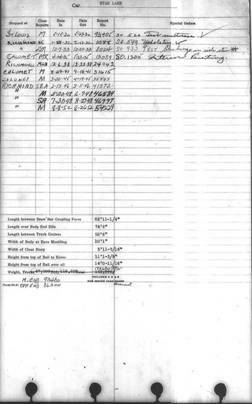 Entries on a CCR tracked a car’s administrative and physical history from delivery through Pullman’s disposition of the car. Heavyweight and lightweight cars owned by railroads but leased to Pullman for operation were tracked until withdrawn from lease. Changes in equipment, configuration, interior appointments and painting were documented, enabling anyone to tell the current status of a car at a glance. The CCR shown below is typical. STAR LAKE was a Plan 3585B 10-1-2 sleeper assigned to, and in 1948 purchased by, the Santa Fe. In 1935 the vestibule at the section end of the car was removed to enlarge the men’s smoking room and lavatory, reconfiguring the car to Plan 3585E. The front of the CCR shows the car’s administrative history, mechanical equipment, and interior and exterior appointments and appearance. The back of the CCR shows the car’s shopping and repair history, dimensions and weight. Information on interior appointments, furnishing and decorating is on the CCR but not in the database. These can be studied by viewing full-size images of the front and back of this CCR. Click on the images or on the links below them for full-size JPEG versions.